Alanen, Y. O. (1997). Schizophrenia: Its Origins and Need-Adapted Treatment. London: Karnac Books. Alvarez, A. & Reid, S. (Eds.) (1999). Autism and Personality: Findings from the Tavistock Autism Workshop. London: Routledge. Amador, X. F. & David, A. S. (Eds.) (1998). Insight and Psychosis. Oxford, UK: Oxford University Press. Appel, J. W. (2000). Who’s in Charge? Autonomy & Mental Disorder.Danbury, CT: Rutledge Books, Inc.
Arieti, S. (1974). Interpretation of schizophrenia (2cd ed.). New York: Basic Books. Arieti, S. (On Schizophrenia, Phobias, Depression, Psychotherapy and the Farther Schores of Psychiatry. NY: Brunner/Mazel. Aulangier, P. (2001). The Violence of Interpretation: From Pictogram to Statement. Philadelphia: Taylor & Francis Inc.
Benedetti, G. (1987). Psychotherapy of schizophrenia. New York: New York University Press. Benedetti, G. & Furlan, P.M. (Eds.). (1993). The psychotherapy of schizophrenia. Seattle: Hogrefe & Huber. Bergmasn, A. (1999). Ours, Yours, Mine: Mutuality and the Emergence of the Separate self. Northvale, NJ: Jason Aronson Inc.
Berke, J. et al 1998). Even Paranoids have Enemies: New Perspectives on Paranoia and Persecution. NY: Routledge. Bion, W. R. (1993). Second Thoughts: Selected Papers on Psycho-Analysis. Northvale, NJ: Jason Aronson Inc.
Bolton, D. & Hill, J. (1996). Mind, Meaning, and Mental Disorder: The Nature of Causal Explanation in Psychology and Psychiatry. NY: Oxford University Press. Bremner, J. (2002). Does Stress Damage the Brain? Understanding Trauma-related Disorders from a Mind-Body Perspective. NY: W. W. Norton & Company. Buckley, P. (1988). Essential Papers on Psychosis. NY: New York University Press. Bullard, D. M. (Ed.) (1959). Psychoanalysis and Psychotherapy: Selected Papers of Freida Fromm-reichmann. Chicago: The University of Chicago Press. Burston, D. (1996). The Wing of Madness: The Life and Work of R. D. Laing. Cambridge, MA: Harvard University Press. Burton, A.(Ed.) (1961).Psychotherapy of the Psychoses. NY: Basic Books. Castle, D., Copolov, D. & Wykes, T. (Eds.) (2003). Pharmacological and Psychosocial Treatments in Schizophrenia. London: Martin Dunitz. Chadwick, P., Birchwood, M. & Trower, P. (1996). Cognitive Therapy for Delusions, Voices and Paranoia. NY: John Wiley & Sons. Ciompi, L. (1988). The psyche and schizophrenia: The bond between affect and logic. Cambridge: Harvard University Press. De Groef, J. & Heinemann (Eds.) (1999). Psychoanalysis and Mental Handicap. London: Free Association Books. De Masi, F. (Ed.) (2001). Herbert Rosenfeld at Work: The Italian Seminars. London: Karnac. De Waelhens, A. & Ver Eecke, W. (2001). Phenomenology and Lacan on Schizophrenia, After the Decade of the Brain. Eigen, M. (1993). The Psychotic Core. Northvale, NJ: Jason Aronson Inc.
Eigen, M. 2002). Rage. Middletown, CT: Wesleyan University Press. Ellwood, J. (Ed.) (1995). Psychosis: Understanding and Treatment. London: Jessica Kingsley Publishers. Federn, P. (1953). Ego Psychology and the Psychoses. London: Maresfield Reprints. Feinsilver, D.B. (Ed.). (1986). Towards a comprehensive model for schizophrenic disorders: Psychoanalytic essays in memory of Ping-Nie Pao, M.D. Hillsdale: The Analytic Press. Fowler, D., Garety, P. & Kuipers, E. (1995). Cognitive Behaviour Threrapy for Psychosis: Theory and Practice. NY: John Wiley & Sons. Freeman, T. (1988). The Psychoanalyst in Psychiatry. London: Karnac Books. Fromm, M. G. & Smith, B. (Eds.) (1989). The Facilitating Environment: Clinical Applications of Winnicott’s Theory, pp. 489-515. Madison, Ct: International Universities Press. Frosch, J. (1983). The Psychotic Process. NY: International Universities Press, Inc.
Garfield, D.A.S. (1995). Unbearable Affect: A Guide to the Psychotherapy of Psychosis. NY: John Wiley & Sons. Glass, J. M. (1985). Delusion: Internal Dimensions of Political Life. Chicago: The University of Chicago Press. Glass, J. M. (1995). Psychosis and Power: Threats to Democracy in the Self and the Group. Ithaca, NY: Cornell University Press. Green M. F. (2001). Schizophrenia Revealed: From Neurons to Social Interactions.London: W. W. Norton. Haddock, G. & Slade, P. (Eds.) (1996). Cognitive-Behavioral Interventions with Psychotic Disorders.NY: Routledge. Häfner, H. (Ed.) (2002). Risk and Protective Factors in Schizophrenia: Towards a Conceptual Model of the Disease Process. Germany: Springer. Hansen, J. B. (1993). Crossing the Borders: Psychotherapy of Schizophrenia. Sweden: Dualis. Harrop, C. & Trower, P. (2003). Why does Schizophrenia Develop at Late Adolescence? : A Cognitive-Developmental Approach to Psychosis.UK: Wiley. Healy, D. (2002). The Creation of Psychopharmacology.Cambridge, MA: Harvard University Press. Heinrichs, R. W. (2001). In Search of Madness: Schizophrenia and Neuroscience. Oxford, UK: Oxford University Press. Hogarty, G. E. (2002). Personal Therapy for Schizophrenia and Related Disorders: A Guide to Individualized Treatment. NY: The Guilford Press. Honig, A. M. (2001). Hard Boiled Eggs and Other Psychiatric Tales: The Rebirth of the Psychotherapy of Severe Mental Illness. North Street Publishers. Hornstein, G. A. (2000). To Redeem One Person is to Redeem the World: The Life of Frieda Fromm-Reichmann. NY: The Free Press. Varieties of Human Experience. Oxford: Clarendon Press. Hyatt-Williams, A. (1998). Cruelty, Violence, and Murder. Northvale, NJ: Jason Aronson. Hyman, S.E., & Nestler, E. J. (1993). The molecular foundations of psychiatry. Washington, D.C. American Psychiatric Press. Jacobson, E. (1967). Psychotic Conflict and Reality. NY: International Universities Press, Inc.
Jackson, M. (2001). Weathering the Storms: Psychotherapy for Psychosis. NY: Karnac. Jackson, M. & Williams, P. (Eds.). (1994). Unimaginable Storms: A Search for Meaning in Psychosis. London: Karnac Books. Jamison, K. R. (1995). An Unquiet Mind: A Memoir of Moods and Madness. NY: Vintage Books. Kahr, B. (Ed.) (2001). Forensic Psychotherapy and Psychopathology. London: Karnac Books. Kapur, S. & Lecrubier, Y. (Eds.) (2003). Dopamine in the Pathophysiology and Treatment of Schizophrenia. : New Findings. Martin Dunitz. Karon, B.P., & Vandenbos, G.R. (1981). Psychotherapy of Schizophrenia: The Treatment of Choice. Northvale, NJ: Jason Aronson, Inc.
Keshavan, M. S. & Murray, R. M. (Eds.) (1997). Neurodevelopment & Adult Psychopathology. Cambridge, UK: Cambridge University Press. Kingdom, D. & Turkington, D. (1994). Cognitive-Behavioral Therapy of Schizophrenia. NY: The Guilford Press. Kircher, T. & David, A. (2003) (Eds. ).The Self in Neuroscience and Psychiatry. Cambridge, UK: Cambridge University Press. Levy, A. et al (Eds.) (1998). New Frontiers in Stress Research: Modulation of Brain Function. Australia: Harwood Academic Publishers. Little, M. I. (1990). Psychotic Anxieties and Containment: A Personal Record of an Analysis with WinnicottNorthvale, NJ: Jason Aronson Inc.
Lotterman, A. (1996). The psychological therapy of schizophrenic patients. In Specific Techniques for the Psychotherapy of Schizophrenic Patients, pp. 69-114. Madison, CT: International Universities Press. Mace, C. & Margison (Eds.) (1997). Psychotherapy of Psychosis. UK: Gaskell. Marcus, E. R. (1992). Psychosis and Near Psychosis: Ego Function, Symbol Structure, Treatment. NY: Springer-Verlag..
Martindale, B. et al (Eds.) (2000). Psychosis: Psychological Approaches and their Effectiveness-Putting Psychotherapies at the Centre of Treatment. UK: Gaskell for ISPS. Mechanism. London: Harwood Academic Publishers. Mitrani, T. & Mitrani, J. L. (Eds.) (1997). Encounters with Autistic States: A Memorial Tribute to Frances Tustin. Northvale, NJ: Jason Aronson Inc.
Morrison, A. (Ed.) (2002). A Casebook of Cognitive Therapy for Psychosis. NY: Brunner-Routledge. Nelson, C. A. (Ed.) (2000). The Effects of Early Adversity on Neurobehavioral Development: The Minnesota Symposia on Child Psychology-Volume 31. London: Lawrence Erlbaum Associates, Publishers. Nestler, E. J., Hyman, S. E. & Malenka, R. C. (2001). Molecular Neuropharmacology: A Foundation for Clinical Neuroscience. NY: The McGraw-Hill Companies, Inc.
Oldham, J. & Bone, S. (Eds.) (1994). Paranoia: New Psychoanalytic Perspectives. Madison, CT: International Universities Press, Inc.
Pally, R. (2000). The Mind-Brain Relationship.London: Karnac. Pao, P.-N. (1979). Schizophrenic Disorders. New York: International Universities Press. Perris, C. & McGorry, P. D. (1998). Cognitive Psychotherapy of Psychotic and Personality Disorders: Handbook of Theory and Practice. NY: John Wiley & Sons. Podvoll, E. M. (2003). Recovering Sanity: A Compassionate Approach to Understanding and Treating Psychosis. London: Shambhala. Prouty, G. (1994) Theoretical Evolutions in Person-Centered / Experiential Therapy: Applications to Schizophrenic Psychoses. Westport,CT., Praeger. Prouty, G. Van Werde, D. Portner, M., (2002) Pre-Therapy: Reaching Contact Impaired Clients. Ross-on-Wye (England) PCCS Books. Rachman, S. (2003). The Treatment of Obsessions. Oxford, UK: Oxford University Press. Resnik, S. (1990). Mental Space. London: Karnac. Resnik, S. (2001). The Delusional Person: Bodily Feelings in Psychosis. NY: Karnac. Rey, H. (1994). Universals of Psychoanalysis in the Treatment of Borderline and Psychotic States: Space-Time and Language Factors. London: Free Association Books. Robbins, M. (1993). Experiences of Schizophrenia: An Integration of the Personal, Scientific and Therapeutic. NY: The Guilford Press. Rose, S. (1998) (Ed.). From Brains to Consciousness? Essays on the New Sciences of the Mind. Princeton, NJ: Princeton University Press. Rosenfeld, D. (1992). The Psychotic: Aspects of the Personality. NY: Karnac Books. 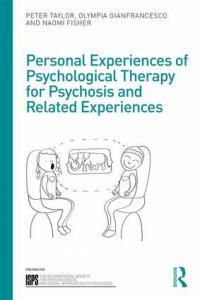 Rosenfeld, H. (1987).Impasse and Interpretation: Therapeutic and Anti-Therapeutic Factors in the Psychoanalytic Treatment of Psychotic, Borderline, and Neurotic Patient. London: Tavistock Publications. Rustin, M. et al (Eds.) (1997). Psychotic States in Children. NY: Routledge. Sabo, A. N. & Havens, L. (Eds.) (2000). The Real World Guide to Psychotherapy Practice. Cambridge, MA: Harvard University Press. Sacksteder J., Schwartz, D.P., & Akabane, Y. (Eds.). (1987). Attachment and the therapeutic process: Essays in honor of Otto Allen Will, Jr., M.D. Madison: International Universities Press. Schachter, M. (Ed.) (1993). Psychotherapy and Medication: A Dynamic Integration. Northvale, NJ: Jason Aronson. Scheflen, A. E. (1981). Levels of Schizophrenia. NY: Brunner/Mazel. Schermer, V. L. & Pines, M. (1999). Group Psychotherapy of the Psychoses: Concepts, Interventions and Contexts. London: Jessica Kingsley Publishers. Schwartz, J. & Begley, S. (2002). The Mind and the Brain: Neuroplasticity and the Power of Mental Force. NY: HarperCollins. Schulz, C. G. & Kilgalen, R. K. (1969).Case Studies in Schizophrenia. NY: Basic Books. Searles, H.F. (1965). Collected papers on schizophrenia and related subjects New York: International Universities Press. Searles, H.F. (1979). Countertransference and related subjects: Selected papers. New York: International Universities Press. Sechehaye, M. A. (1951). Symbolic Realization: A New Method of Psychotherapy Applied to a Case of Schizophrenia. NY: International Universities Press, Inc.
Shapiro, D. (2000). Dynamics of Character: Self-Regulation of Psychopathology. NY: Basic Books. Siegel, D. (1999). The Developing Mind: Toward a Neurobiology of Interpersonal Experience. NY: The Guilford Press. Siegel, G. J. et al (Eds.) (1999). Basic Neurochemistry: Molecular, Cellular and Medical Aspects-Sixth Edition. NY: Lippincott-Raven. Siirala, M. 1983). From Transfer to Transference: Seven essays on the Human predicament. Helsinki University Press. Silver, A.-L. (Ed.). (1989). Psychoanalysis and psychosis. Madison: International Universities Press. Silver, A-L. & Cantor, M. (1990). Psychoanalysis and Severe Mental Illness. NY: The Guilford Press. Sims, A. (2003). Symptoms in the Mind: An Introduction to Descriptive Psychopathology-Third Edition. UK: Saunders. Solms, M. & Turnbull, O. (2002). The Brain and the Inner World: An Introduction to the Neuroscience of Subjective Experience. NY: Other Press. Spotnitz, H. (1999). Modern Psychoanalysis of the Schizophrenic Patient. Nothvale, NJ: Jason Aronson Inc.
Stahl, S. M. (2000). Essential Psychopharmacology: Neuroscientific Basis and Practical Applications. Cambridge, UK: Cambridge University Press. Strauss, J. S. et al (Eds.) (1993). The Psychotherapy of Schizophrenia. Northvale, NJ: Jason Aronson Inc.
Stein, D. J. & Ludnik, J. (1998). Neural Networks and Psychopathology: Connectionist Models in Practice and Research. Cambridge, UK: Cambridge University Press. Stone, M. et al (Eds.) (1983). Treating Schizophrenic Patients: A Clinico-Analytical Approach. NY: McGraw-Hill Book Co.
Stone, W. N. (1996). Group Psychotherapy for People with Chronic Mental Illness. NY: The Guilford Press. Strauss, J.S. (1997). Processes of healing and the nature of schizophrenia. In H. D. Brenner, W. Boker, and R. Genner (Eds. ), Towards a Comprehensive Therapy for Schizophrenia, pp. 252-261, Seattle, WA: Hogrefe & Huber. Sullivan, H. S. (1956). Clinical Studies in Psychiatry. NY: W. W. Norton & Co., Inc. Symington, N. (2002). A Pattern of Madness. London: Karnac. Tolpin, P. & Tolpin, M. (Eds.) (1996). Heinz Kohut: The Chicago Lectures. Hillsdale, NJ: The Analytic Press. Tustin, F. (1990). The Protective Shell in Children and Adults. London: Karnac Books. Volkan, V. (1995). Psychoanalytic psychotherapy of schizophrenia. In The Infantile Psychotic Self and Its Fates: Understanding and Treating Schizophrenics and Other Difficult Patients. Northvale, NJ: Jason Aronson, Inc., pp. 205-237. Volkan, V., & Akhtar, S. (Eds.). (1997). The Seed of Madness: Constitution, Environment, and Fantasy in the Organization of the Psychotic Core, pp. 19-57, Madison, CT: International Universities Press. Whitaker, L. C. (1992). Schizophrenic Disorders: Sense and Nonsense in Conceptualization, Assessment, and Treatment. NY: Plenum Press. Whitaker, R.( 2002). Mad in America: Bad Science, Bad Medicine, and the Enduring Mistreatment of the Mentally Ill. Cambridge, MA: Perseus Publishing. Williams, A.H. (1998). Cruelty, Violence and Murder: Understanding the Criminal Mind. Northvale, NJ: Jason Aronson, Inc.
Williams, P. (1999). (Ed.). Psychosis (Madness). London: The Institute of Psychoanalysis. Williams, P. (2001). A Language for Psychosis.NY: Brunner-Routledge.